omino's last issue will be released this March, April will be a disappointing month for many. 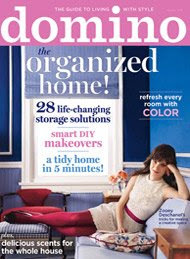 It is joining several other home decor magazines that shuttered their doors in 2008: Meredith's Country Home, Time Inc.'s Cottage Living, Hearst's O at Home, Martha Stewart Living Omnipedia's BluePrint and Conde Nast's House & Garden. The website will be shuttered as well, so I'll have to go save anything I had marked as a favorite before it's gone for good. Which magazine is next? I know, sign of the times, but it will be sorely missed. It's probably a combination of the proliferation of design blogs as well as the economy. I love to slip through magazines though, I'll miss the loveliness of it all. There is just something about the feel of a magazine and its glossy pages that can't be duplicated with an online publication. Ny idea books and bulletin boards will never be the same. I will miss these magazines A LOT. I loved the Mary Engelbreit Home Companion magazine. She has such flair and it was always fun to read. I just Googled it and I see they are looking for a new publisher, hopefully something can be done!